On a daily basis, you examine hundreds of documents such as letters, e-mails, native files, spreadsheets and other e-documents, to determine whether the information should be turned over to an opposing party in response to a discovery request. In Lexbe eDiscovery Platform you have multiple ways of moving through documents quickly for a document review. a-Use the 'Save' Button. Code the current file, and just click on the 'Save' button. Please note this command will only save the tags applied (e.g. 'Responsive', 'Confidential', etc. ), without moving to the next document. b-Auto-Advance (check-box): If you want to move to the next documents automatically, then you need to select the 'Auto-Advance' check-box. This option lets you review, code and advance to the 24 subsequent documents in list. After 25 documents, close the current window and return to the Browse or Search pages. Advance a page at the bottom of the main table, and then click on the first document in the page to open the document viewer to proceed for the next 25, etc. NOTE. Please note that the 'Auto Advance' + 'Propagate Coding' check-boxes settings will only persist to the list of 25 documents carried over in the Document Viewer, AND will not apply the same coding to next document in line. Open documents to review in Browse or Search as above. Select the fields you would like to review in the Browse or Search screen from the section Fields>Select Fields. Now open a document by right clicking in windows or Control-Click in Mac and select 'Open Link in New Window'. 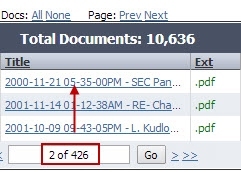 Then advance documents by clicking on the document links in Browse or Search. >Select documents to review from the Browse or Search pages, choosing also the field of data to review. >Then download log to Excel. You can modify document coded data and tag multiple files by generating custom Excel spreadsheets uploaded into a case in Lexbe eDiscovery Platform. This allows the user to edit most fields in Lexbe eDiscovery Platform, restore email families in an Excel spreadsheet, upload that spreadsheet to the applicable case, and have the field data in Lexbe be automatically updated. This function is only available for specific users with 'Power Upload' privileges enabled. An Account Admin User must submit a support ticket to request this privilege for themselves or particular users. >If you are reviewing a set of targeted documents opened from the Browse or Search pages, you can still view only the next files resulted from filters without switching tabs by clicking on the ‘< Viewing Doc X of X: >’ hyperlink located at the top of the page. >The 'Title' hyperlink from the Doc Tab allows you to navigate forward and open the subsequent document title from all the documents in the case. One of reasons the navigation <Title> was designed this way is that if certain documents were previously Bates-stamped in their titles, such as email families, by using this feature you will be able to open the main email body and the attachments without having to apply any filters or searches.